On the 26th to 28th June 2015 Badminton Ireland hosted the first Carlton Irish Para-Badminton Open and the competition attracted many of the world’s leading Para-Badminton players. Nottinghamshire’s Team England Para-Badminton player Owen Kilburn paired up with Jordy Brouwer Von Gonzonbach from the Netherlands and came away from the championships with a Bronze medal in the wheelchair mens doubles. Unfortunately they had lost out to the eventual winners and top seeds Ho Yuen Chan (Hong Kong) / David Toupe (France) in the semi-final. In the wheelchair mixed doubles Owen and his partner, Scotland’s Fiona Christie, reached the quarter finals and were beaten by the first seeded pairing of Ho Yuen Chan / Karin Suter (Switzerland). In the wheelchair class 1 mens singles, Owen put in his best singles performances in International competitions so far by reaching the quarter finals and just losing out to 3rd seed Avni Kertmen from Turkey. In a very close 55 minute match, the scores ended 25-23 22-24 19-21. 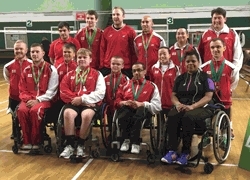 Team England came away with a total of 10 medals and the championships were great preparation for the upcoming Para-Badminton world championships to be hosted by Badminton England in September 2015. These will be held at Stoke Mandeville Stadium, the home and birthplace of the Paralympics. Click for more details of the upcoming Para-Badminton World Championships.